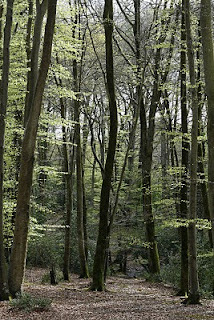 Spring in the New Forest, and the new beech leaves just coming through. The light filtered down as though from clerestory windows, the smooth columns of the trunks drawing the eye up to the vaulted branches above. Beech leaves secrete substances that inhibit the growth of other species, so the forest floor in beech woods remains a carpet of russet leaves and mast – another reason for their strange, almost sacrosanct atmosphere.